When I was in middle school I read a lot of women’s magazines- Cosmo, Allure, Glamour, etc. and they would often times have features on how to transform your makeup from day to night or how to take your look from the office to happy hour drinks. I used to think these articles were so dumb. Who couldn’t figure out this very simple task!? Put on more eye makeup- eyeliner, shadow, extra mascara, etc., a bold lip, a little perfume and bam you’re done. Now that I’m a grown up and actually have to do this task I realize it can be very difficult. Most YouTube gurus and makeup artists will tell you to just wash your face and start all over again. Who has time for that!? Especially if you’re going on dates during the week you need to take your 6am makeup and transform it into date-ready 8pm makeup and FAST. I have yet to see a YouTube tutorial on how to do this (there are many where they do one makeup look and then immediately change the lip color and say now it’s a night look! But that leaves out the whole your foundation is coming off and everything is patchy problem). Do I look terrible? No. Are all of the lines on my forehead and everywhere else accentuated? Yes. 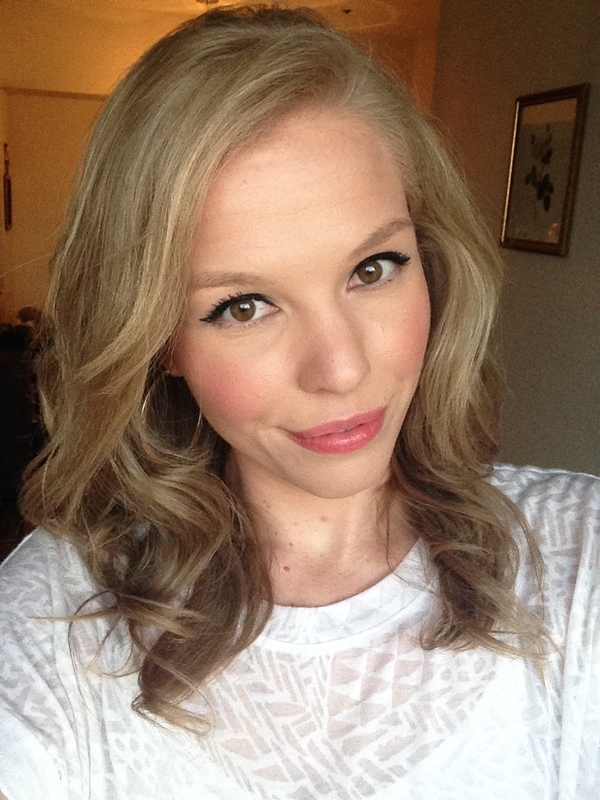 My face also turned out super white which made my blush and lips look all that much more intense. I still went out like this, but I didn’t feel great. A few weeks ago I went to the Nordstrom Fall Beauty Event and asked my artist if he had any tips for me and he gave me a great one: use a different type of foundation than the one you used the first time. OMG brilliant!! This totally makes sense too! In the AM I tend to use a matte foundation so if I put another coat of that on top with powder it’s going to totally age me! Now I give my face a quick spritz of Mac Fix+ or the Boots Rosewater Spray I mentioned in my September favorites and then apply a luminous foundation like my Armani Luminous Silk right on top of the makeup I was previously wearing. From there I will apply concealer, bronzer, blush, more mascara, and a little powder to set everything. This has been an awesome little trick and I feel like it has really helped me. It is monthly favorites time again and this time I managed to pick more than 5 things woo hoo! I try a lot of new products (but also tend to do the same makeup for work daily), but I’m so picky that it’s hard for me to choose which ones really stand out to show you all. 1. Versace Bright Crystal eau de toilette ($52 for 1oz. at Sephora, but I bought mine at Nordstrom Rack in San Francisco for $29.99) – This month I traveled to San Francisco for the weekend and had some time to kill so I went shopping. I love getting new stuff on vacation because it reminds me of the good times that I had on my trip. This perfume is light, feminine, and clean smelling to me, but let’s see what the pros say: “Bright Crystal is a fresh, sensual blend of refreshing chilled yuzu and pomegranate mingled with soothing blossoms of peony, magnolia, and lotus flower, warmed with notes of musk and amber.” Ok so I was pretty close. My only gripe with this perfume is that it does not last!! A quick glimpse on the reviews at Sephora.com confirmed that I’m not the only one that feels this way. That is why I bought this perfume 3 weeks ago and about 1/4 of it is gone already and I didn’t even wear it everyday! I do always apply it very liberally and I also like to spray myself and my sheets before I go to bed because it smells awesome. If I hadn’t gotten this one for under $30 I definitely would not be spraying it so much. 2. 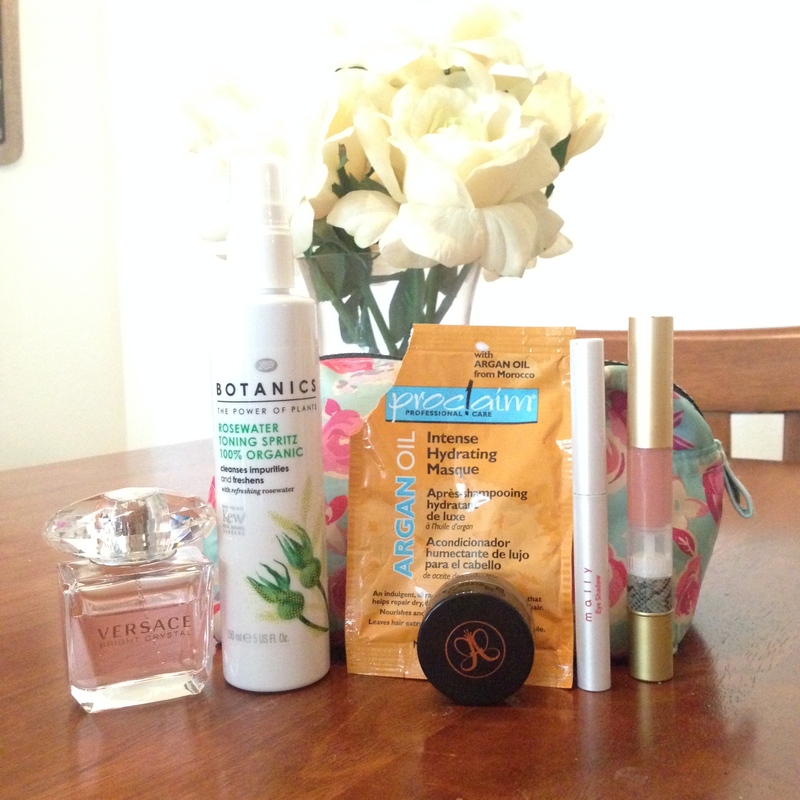 Boots Botanics Rosewater Toning Spritz ($9 at Target) – I love a face mist. I really love MAC Fix Plus which I lovingly refer to as “Gypsy Water” but at $22 a pop I can’t generously douse myself in it everyday like I would like to. I will make a whole separate post on MAC Fix Plus spray to explain what the hell it is and how I use it in the future. This toning spritz smells exactly like roses and feels super refreshing and luxurious. I spray it on after washing my face or before I apply moisturizer. I also will spray some on my face before applying “a second layer of paint” aka another coat of makeup for night time when I’m in a rush. It’s supposed to “visibly tighten pores and remove the last traces of makeup” and claims that “Skin feels smoother, fresher, and prepared for moisturizing”. I only mist it on my face not on a cotton pad to remove makeup so I have no clue if it removes makeup well. Are my pores visibly tightened? Meh. Does my skin feel smoother, fresher, and prepared for moisturizing? Sure. I feel like this has been nice in the 90+ degree weather lately and will probably be nice and moisturizing when it gets colder. 3. Proclaim Professional Care Argan Oil Intense Hydrating Masque ($2 at Sally Beauty Supply) – This is just a nice moisturizing mask that’s ultra conditioning and it’s supposed to nourish hair making it soft, silky and manageable. I think it definitely did those things and my hair looked a little healthier after I used it. You can see that this one is opened because I’ve already used it twice and will probably be able to get 2 more uses out of it. Not bad for $2.